Steelhead 70.3 is the final Midwest half-iron distance (in the Ironman circuit) triathlon of the season, and it never disappoints. 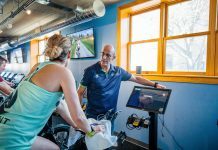 The 1.2-mile swim takes place in Lake Michigan, the 56-mile bike (primarily) on Blue Star Highway, and the 13.1-mile run on a double-loop course around the Whirlpool campus. This year, both male and female professionals were also competing. Male pros started at 6:45 a.m., followed by female pros at 6:50 a.m., and finally the self-seeded age group start at 7am. Athletes are always in for a surprise with the swim, and this year was no different. Since the swim is in Lake Michigan, athletes often are anxiously awaiting race morning to find out if the swim will be wetsuit legal or not. And forget about planning your swim out; the water is super unpredictable and could be like glass one day and super choppy the next. This year, things were made even worse for many athletes when the water temperature was measured at 76.4 degrees on race morning. This meant that athletes could only wear wetsuits if they did not want to be eligible for awards (or placement in age group). The “wetsuit wave” was actually pretty popular, which I think was probably due to the choppy water conditions. 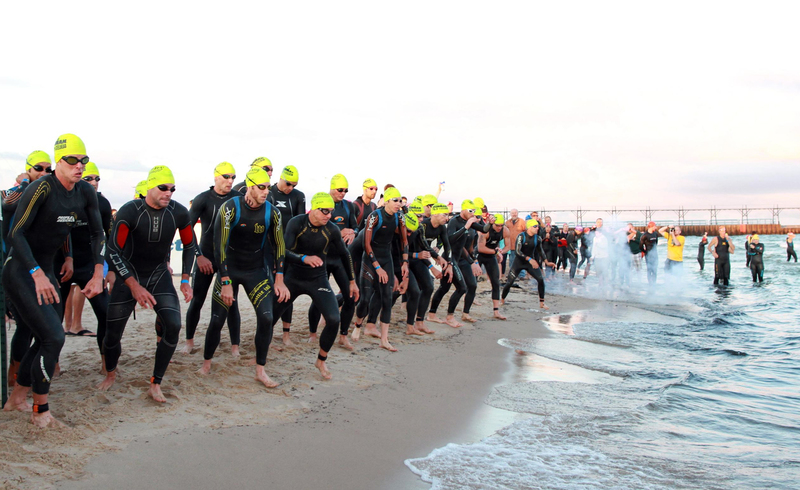 After exiting the water, athletes run through the sand before reaching transition; while the run through the sand feels like it takes forever, it is heavily lined with spectators who are cheering like crazy! The 56-mile bike route was altered a bit this year so that more of the route was actually on the Blue Star Highway. Athletes exit transition and do a little loop before heading up a little highway ramp that begins a 10-mile stretch on Blue Star Highway. Miles 12 – 24 are part of the former course, on some of the roads that are not as nicely paved (bumpy) compared to the highway. Back onto the Blue Star Highway just before mile 25, riders do a little turn-around loop through a bike path area around mile 33. The remaining 23 miles are on the Blue Star Highway, which has a few rolling hills, but no big climbs. No one seemed to really be bothered by the change in bike course, and it seemed that most people enjoyed it overall. The finish was the same as usual: riders turn into Jean Klock Park and ride up a little bike path before rolling over a short wooden plank path, during which single file riding is “enforced” (as in if you get caught passing during this section, you get a penalty). Onto the run: I don’t remember a year where the run wasn’t described as hot or humid or hard, or all three! Athletes come out of transition the same way that they did for the bike, so again are greeted with cheers (which are always welcome on a long, hot day!). The run is about 1.5-miles out, two 5ish mile loops around the Whirlpool Campus, and 1.5-miles back in. About ¾ of a mile into the run, you are greeted with a tough hill but are quickly rewarded with an aide station and energetic volunteers at mile 1. Fortunately, you get to go down this tough hill at the end mile of the 13.1, giving your body a little boost to make it to the finish line! After finishing the race, athletes are treated with a Pizza Hut buffet (pizza, pasta, burgers, soft drinks) as they “relax” at the beach. While not super spectator friendly, it seems to be a good race for the family if relaxing and playing at the beach is appealing to your family. Just make sure to bring the sunscreen!